This article is about the media company. For the company prior to the spin off and acquisition by The Walt Disney Company, see 21st Century Fox. 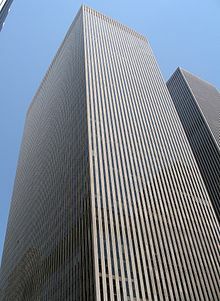 The Fox Corporation (abbreviated Fox Corp. and informally "New Fox") is an American television broadcasting company headquartered in Midtown Manhattan, New York City. It was formed from the 2019 acquisition of 21st Century Fox (itself formed from the 2013 split of News Corporation) by the Walt Disney Company. Fox Corp. was spun off from 21st Century Fox and its stock began trading on March 19, 2019. It is owned by the Murdoch family via a family trust with 39% interest; Rupert Murdoch is co-executive chairman, while his son Lachlan Murdoch is chairman and CEO. Fox Corp. deals primarily in the television broadcast, news, and sports broadcasting industries by way of the remaining 21st Century Fox assets that were not acquired by Disney. They include the Fox Broadcasting Company, Fox Television Stations, Fox News, the Fox Business Network, the national operations of Fox Sports, and others. Its sister company under Murdoch's control, the present-day News Corp, holds his print interests and other media assets in Australia. On December 14, 2017, The Walt Disney Company announced its intent to acquire the motion picture, cable entertainment, and direct broadcast satellite divisions of 21st Century Fox. The remainder of the company, would form a so-called "New Fox", maintaining control of assets such as Fox's television network and broadcast stations, Fox News Channel, and the national operations of Fox Sports, among other assets. Fox's regional sports networks were to be included in the sale to Disney. In May 2018, it was confirmed that Lachlan Murdoch, rather than James Murdoch, would take charge of the New Fox company. The merger faced antitrust scrutiny; Disney would not legally be able to own both the ABC and Fox networks due to an FCC policy known as the "dual network rule", which prohibits mergers between the top broadcast networks. The Department of Justice also ordered that Fox's regional sports networks be divested by Disney within 90 days of closing. Disney owns 80 percent of ESPN, and the Justice Department felt that the Fox regional networks' combination with ESPN would make Disney too dominant in the cable sports market. In mid-2018, Comcast instigated bidding wars over both the assets Disney planned to purchase, and the British broadcaster Sky plc (a company which 21st Century Fox held a stake in, and was planning to acquire the remainder). In July 2018, Fox agreed to an increase of Disney's offer to $71.3 billion to fend off Comcast's counter-bid. British regulators ordered that a blind auction be held for Sky's assets, which would be won by Comcast. On October 10, 2018, it was reported that in preparation for the impending completion of the sale, the new, post-merger organizational structure of "New Fox" would be implemented by January 1, 2019. On November 14, 2018, it was revealed that the new independent company will maintain the original Fox name. On January 7, 2019, Fox Corporation's registration statement was filed with the U.S. Securities and Exchange Commission. On January 11, 2019, Fox stated in a securities filing that it had no plans to bid on its former regional sports networks. On March 12, 2019, Disney announced that the sale would be completed by March 20, 2019. On March 19, 2019, Fox Corporation officially began trading on the S&P 500, replacing 21st Century Fox on the index. Republican politician and former speaker of the house Paul Ryan also joined Fox's board at this time. Impression Sports & Entertainment – naming rights and event sponsorships. ^ "Fox Corporation Announces First Day as Standalone, Publicly Traded Company; Appointment Of Anne Dias, Chase Carey, Roland A. Hernandez and Paul D. Ryan To The Board Of Directors; and Adoption Of Temporary Stockholder Rights Agreement". Fox Corporation Press Release. March 19, 2019. Retrieved March 19, 2019. ^ a b "21st Century Fox Announces Filing of Registration Statement on Form 10 for Fox Corporation". 21st Century Fox. January 8, 2019. Retrieved January 8, 2019. ^ a b Disis, Jill (May 16, 2018). "Lachlan Murdoch, not James, will lead New Fox company". CNN Money. Archived from the original on May 17, 2018. Retrieved May 17, 2018. ^ a b c Holloway, Daniel (October 10, 2018). "Fox Will Be Ready to Close Disney Deal Jan. 1, Says Peter Rice (EXCLUSIVE)". Variety. Archived from the original on October 11, 2018. Retrieved November 21, 2018. ^ a b Littleton, Cynthia (January 11, 2019). "Fox Confirms It Won't Bid on Disney's Regional Sports Networks". Variety. Retrieved January 11, 2019. ^ "21st Century Fox Announces Pricing Of Senior Notes By Fox Corporation". January 15, 2019. Retrieved February 1, 2019. ^ a b Chang, Sue (March 14, 2019). "Fox Corp. to replace Twenty-First Century Fox on S&P 500". MarketWatch. Retrieved March 19, 2019. ^ James, Meg (June 28, 2013). "News Corp. divides into two companies; 21st Century Fox is born". Los Angeles Times. ISSN 0458-3035. Retrieved April 19, 2019. ^ Littleton, Cynthia; Steinberg, Brian (December 14, 2017). "Disney to Buy 21st Century Fox Assets for $52.4 Billion in Historic Hollywood Merger". Variety. Retrieved February 8, 2018. ^ Gardner, Eriq (December 12, 2018). "FCC Reviewing Rule Prohibiting Mergers Among Big Four Broadcast Networks". The Hollywood Reporter. Retrieved March 19, 2019. ^ Littleton, Cynthia (June 27, 2018). "Justice Department Approves Disney's Acquisition of 21st Century Fox With Divestiture of Regional Sports Networks". Variety. Retrieved June 27, 2018. ^ "Disney wins US antitrust approval to buy Fox assets". CNBC. June 27, 2018. Retrieved June 27, 2018. ^ Brodkin, Jon (June 20, 2018). "Sorry, Comcast: Fox and Disney sign new merger deal, rejecting Comcast bid". Ars Technica. Retrieved June 20, 2018. ^ Lee, Edmund (June 20, 2018). "Disney Ups Its Bid for 21st Century Fox to $71.3 Billion". The New York Times. ISSN 0362-4331. Retrieved April 19, 2019. ^ Waterson, Jim (June 26, 2018). "Rupert Murdoch's Sky reign to end as Fox sells all shares to Comcast". The Guardian. ISSN 0261-3077. Retrieved September 27, 2018. ^ Chmielewski, Dawn (January 7, 2019). "21st Century Fox Files Registration Statement With SEC To Form 'New' Fox". Deadline Hollywood. Retrieved January 7, 2019. ^ Littleton, Cynthia (March 12, 2019). "Disney Sets March 20 Closing Date for 21st Century Fox Acquisition". Variety. Retrieved March 15, 2019. ^ Littleton, Cynthia; Steinberg, Brian (March 18, 2019). "Fox Corporation Emerges as Standalone Entity, Paul Ryan Joins Board". Variety. Retrieved March 19, 2019. ^ a b c d e f g "Board of Directors". Fox Corporation. March 19, 2019. Retrieved March 19, 2019. ^ a b c d e f Lafayette, Jon (October 2, 2018). "'New Fox' Announces Top Executive Appointments". Broadcasting & Cable. Retrieved March 8, 2019. ^ "Fox Corporation Names Joseph Dorrego Chief Investor Relations Officer and Executive Vice President of Corporate Initiatives". Fox Corp. February 15, 2019. Retrieved March 6, 2019. ^ Bing, Jonathan (October 19, 2018). ""FOX" Names Charlie Collier Chief Executive Officer of Entertainment". Fox Corporation. Retrieved March 8, 2019.